The American Paint Horse holds and importance place in Western history. The breed’s ancestors—the two-toned horses of Northern Africa and the Middle East—first appeared on American soil with the Spanish explorers. Inevitably, these horses escaped domesticity, creating wild herds of horses across the Great Plains. The Paint Horse was cherished by horsemen of the American frontier—both Native Americans and cowboys. Over time, breeders have improved the Paint Horse’s athletic ability, but each generation passes along a unique and beautiful coat pattern. In the twenty-first century, the breed is an ideal partner for horse enthusiasts; whether you are interested in pleasure riding, showing, ranching, racing, or trail riding, these mild friends are equipped with a natural intelligence and gentle demeanor. 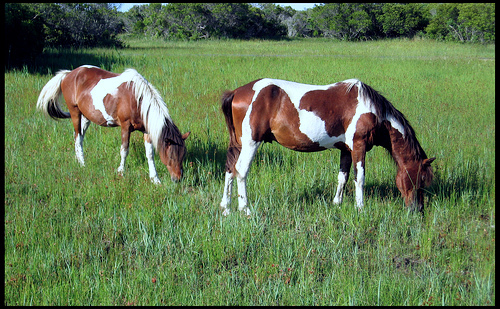 This website is designed to disseminate important information about the American Paint Horse. We would like to be a general knowledge resource for those with recreational interest in the breed, as well as a place for breeders to ask questions. Like so many Americans, we have fallen in love with the American Paint Horse—we know you will, too.